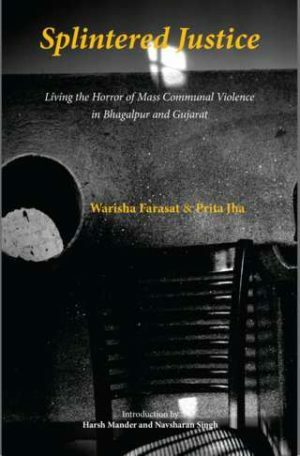 Written with both rigorous scholarly insight and engaged compassion, Splintered Justice: Living the Horror of Mass Communal Violence in Bhagalpur and Gujarat is essential reading for all who care about upholding that most sacred pledge of India’s Constitution, of ensuring the equal treatment of all people, regardless of their faith, caste, gender or wealth, before the law of the land. Categories: History, Politics, Reference, Social Sciences, Sociology and Anthropology, Three Essays Collective. Tags: 9789383968206, Bhagalpur, Gujarat, Indian politics, Rights in India, Social sciences, Sociology, Three Essays Collective. violence, even massacres, of religious minorities. These episodes have been characterised by impunity, or the assurance that those who plan and execute these targeted communal attacks are protected from legal punishment. major communal massacres, of Bhagalpur in 1989 and Gujarat in 2002. Relying not just on official papers but also on in-depth testimonies of many survivors, they systematically chart the troubling failures of India’s criminal justice system to secure justice for survivors of hate violence.